The Number Eight Turquoise mine is in the Lynn mining district in Eureka County, Nevada. The mine has not produced Turquoise for a number of years as it has been taken over by a metal mining company. The Number 8 Turquoise mine was bought up by a gold mining company that does not mine the Turquoise, nor lease out the rights to the Turquoise. There is still quite a bit of #8 Turquoise available through collections and other holdings, though much of what is left in rough is chalk material that needs to be stabilized. 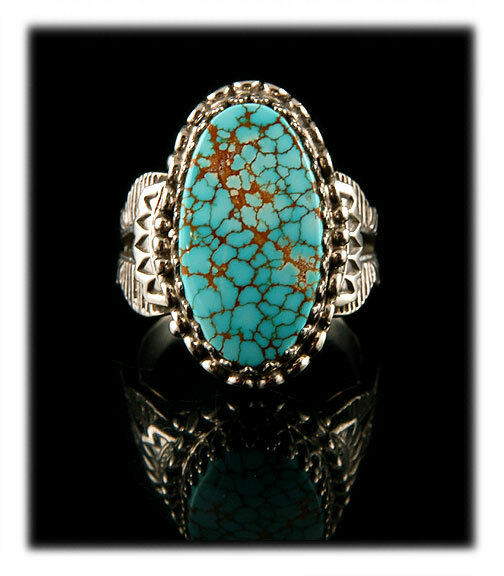 The best, natural spiderweb Material from the #8 Turquoise mine is rare and highly coveted today. The color of Number 8 varies from light blue, blue with shades of green to beautiful dark blue. It is found with a black, golden, red or brown matrix. The classic look of #8 Turquoise is light blue with a golden brown spiderweb matrix. 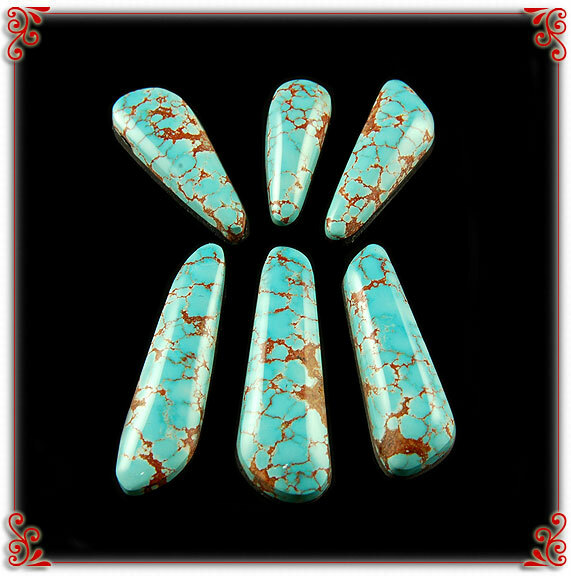 Most Number Eight Spiderweb Turquoise cabochons you will see in collections and jewelry will have this look. The black and red spider web Number Eight Turquoise is the rarest and most Valuable. Today Number 8 Turquoise is one of the most valuable stones that can be collected and one of the most beautiful that can be used in jewelry. High-grade #8 Turquoise is by far some of the finest Turquoise to ever have come out of Nevada. 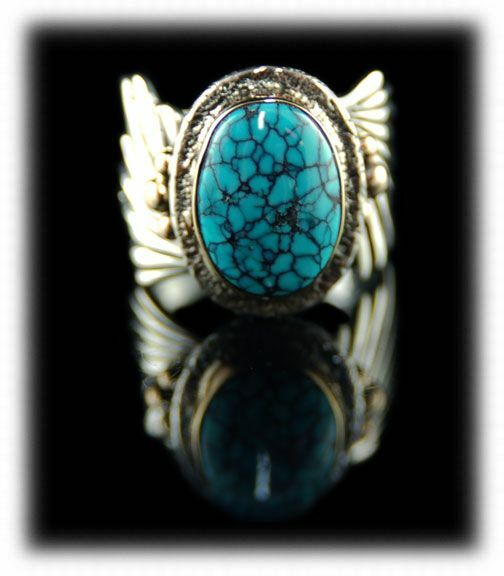 Above to the left is a wonderful gold and silver ring by John Hartman with a top gem grade, natural, black spiderweb Number Eight Turquoise cabochon. 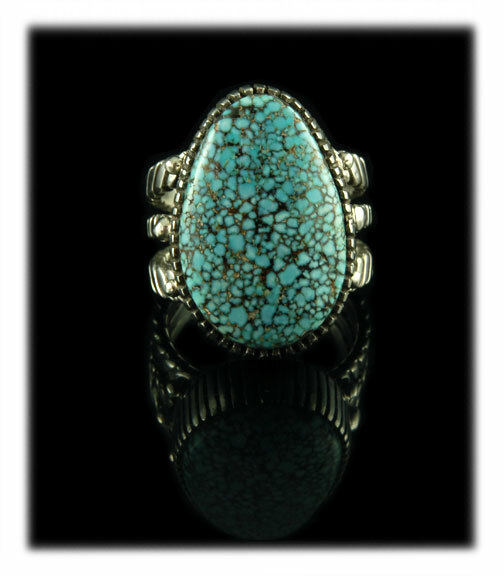 This is some of the rarest #8 Turquoise. To the right is an amazing "Lost Wax" style 14k yellow gold ring by John Hartman with a to gem grade, deep blue Number Eight Spider Turquoise cabochon. This gemstone is extra beautiful and features a deep blue than is common from the #8 mine. Above to the left is a handmade Sterling Silver ring by John Hartman with an oval Number Eight Spiderweb Turquoise cabochon. This awesome specimen has an electric blue color and features vivid golden brown spiderweb matrix. The blue Turquoise in this stone is extra beautiful and has a really great luster. 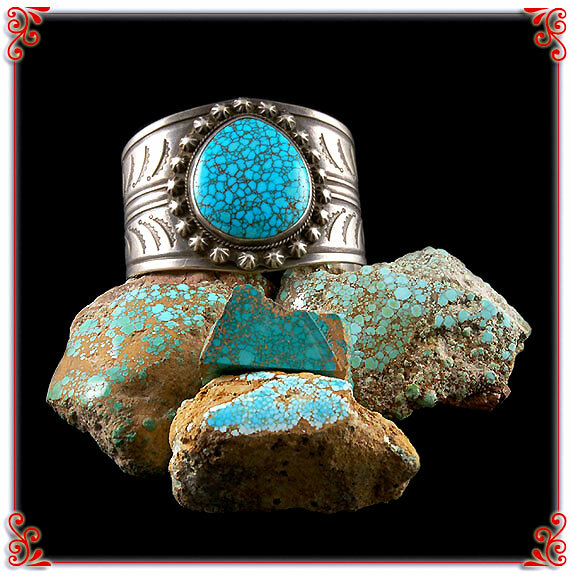 Above to the right is a handmade Sterling Silver ring by Dillon Hartman with a large cabochon of the rare black spiderweb Number Eight Turquoise from Nevada. Earl Buffington and Lawrence Springer filed the first formal claim on the property in 1929. The claim was mainly for copper according to the memory of Clive Edgar. The mine went though a number of owners which included; Ted Johnson, Doc Wilson, Myron Clark, Lee Hand, the Edgar brothers and Dowell Ward. All are important names in Nevada’s Turquoise mining history. The biggest producers at the #8 Turquoise mine where the Edgars (Cutler and Clive Edgar) and Dowell Ward. In the 1950's the Edgars, with a bulldozer, began looking for copper. They found some copper, but they found something more interesting, they had uncovered a deposit of some of the finest spider web Turquoise ever found in Nevada. 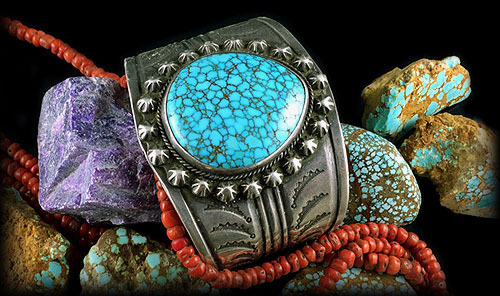 The pocket produced more than 1,600 pounds of the very highest-grade Turquoise, thousands of pounds of gem grade Turquoise, and a ton of chalk Turquoise, a discovery that is still being talked about today. Besides its beautiful Turquoise, Number 8 has also been known for the large nuggets the mine produced. 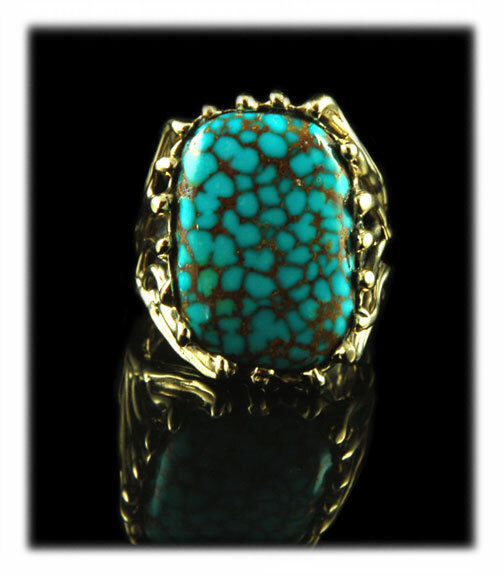 One nodule of high-grade turquoise that was sold to C.G. Wallace weighed more than nine pounds. Another uncovered was one of the largest turquoise nodules ever found. On June 23, 1954, Cutler Edgar, J.M. Edgar and Marvin Symes discovered a specimen that weighed 150 pounds. It was of good color and hardness and classified as gem quality. Above is a rare Number 8 Spiderweb Turquoise Psuedomorph Fossil Clam that has been cut in half. This has not been polished, this is the natural, dry color. We have not shown all the different looks of Number Eight Spiderweb Turquoise, but a nice selection of some of our favorites. Shop for hand cut Spiderweb Number Eight Turquoise Cabochons in our Spiderweb Turquoise Cabochons section. 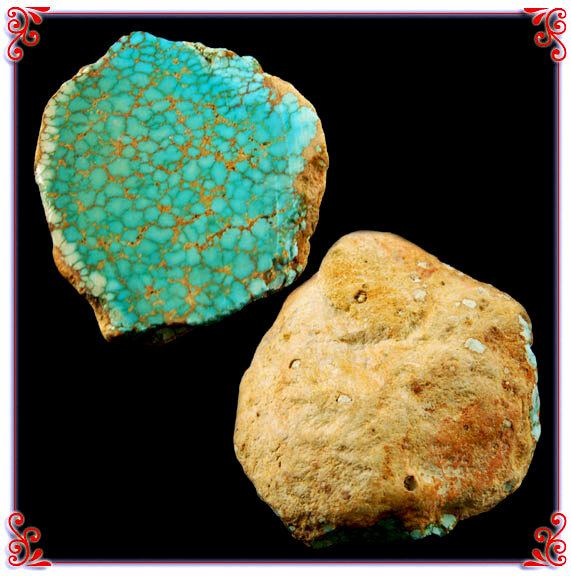 Thank you for reading about #8 Turquoise or Number Eight Spiderweb Turquoise from Nevada, USA.